S&P is the world's leading producer of air movement products. 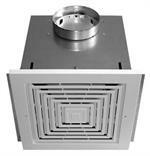 S&P manufactures and supplies fans, dampers, louvers and recovery ventilators (ERVs & HRVs). These products are used in various industries including residential, commercial, industrial and institutional buildings. Soler & Palau PG-150 Intake Grille with Steel Collar - 6"
with static pressure capabilities to 1"